Of Wiarton, suddenly at Summit Place, Owen Sound, on Saturday February 8, 2015. 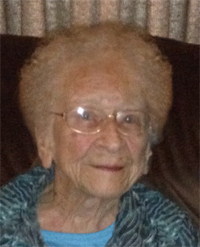 Carrie Gertrude Given (nee Brown) at the age of 92 years. Loving mother of Dianne and her husband William Smart and Linda Hepburn and her partner Mike Ainslie, both of Wiarton, Douglas Given and his wife Laurie, of Mar, and Carol and her husband David McCauley, of Wiarton. Proud grandmother of Carolina (friend Zoltan Hawryluk), William (wife Shannon), Corrina (partner Marty Rouse), Thomas, Trevor (partner Pam Henry), Kyle (friend Heather Higgston), Christie (partner Jake Morton), Nicole (friend Matt Macgean), Shawn (wife Melissa), Jamie, and Todd; great-grandmother of Alexandria, Andrew, Parker, Kyle, Nigel, Gabe, Kylie, Colton, Ryker, and Jase. Sister-in-law of Morgan Given, Alice Sear, Shirley Given, and Kathy Given. Sadly missed by her many nieces and nephews. Predeceased by her parents Joseph and Mae; husband James (1993); brothers and sisters, Harry, Bill, Audrey, Margaret, Gwen, Mabel; and brothers-in-law Bert Given, Bud Given, and Milt Given. Friends may call at the Thomas C. Whitcroft Peninsula Chapel, 272 Berford St., Wiarton on Wednesday, February 11, 2015 from 7-9 PM, where a service celebrating Carrie’s life will be conducted from the chapel on Thursday at 2 o’clock. Spring interment in Colpoy’s Bay Cemetery. Members of RCL Br. 208 Wiarton will conduct a Legion Service on Wednesday evening at 6:30 PM. Donations to RCL Br. 208 Ladies Auxiliary, or the Kidney Foundation would be appreciated.